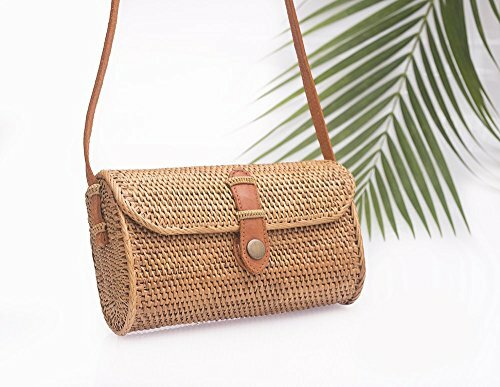 Boho Chic rectangle straw bag, perfect go-to spring accessory will match every kind of style with unique bohemian/vintage style design. Straw bags make us think of summer, the beach, and picnics. Straw bags are no longer just for holidays, they also look super stylish with street style, great for night out or anything in between. This small rectangle Ata bag is just great to fit your iPhone X, a small wallet, keys and lipstick. The bag is hand woven with sturdy and sustainable straw twine lined with unique batik fabric. You will receive a random material on our choice, just as beautiful as the ones photographed. If you have a special wish to choose lining material color/print, please do contact us.Dimensions:Height: 4.7" - 12cmWidth: 7.9" - 20cmDepth: 3.1" - 8cmLeather strap length: 22.8" - 58cmTotal length: 28" - 71cmAta grass is a type of strong and durable vine that allows for very flexible weave. Making process is long and made by hand. Ata grass is a type of strong and durable vine that allows for very flexible weave. Making process is long and made only by hand. Once the bags are woven, they need to be dried in the oven fired by coconut husk to tighten the shape. The smoking process leaves a natural smoky scent, which will dissipate over time when exposure to the air. The bags are Shipped with Express Air Mail which takes 5-7 working days to arrive (only to the US). If you have any questions about this product by Tropical Boho, contact us by completing and submitting the form below. If you are looking for a specif part number, please include it with your message. Lightweight Christmas arm / cross body purse. Poinsettia pattern. Fully padded with foam and lined with black cotton fabric. With zipper and interior pockets. Washable and iron safe.